Mizzou Made Philadelphia Eagles receiver Jeremy Maclin kept up his hot start to the 2014 NFL season on Monday night, catching four passes for 45 yards and a touchdown in Philly’s 30-27 comeback win over the Indianapolis Colts. Maclin’s six-yard touchdown helped the Eagles pull even at 27-27 with 3:25 remaining in the game. Two weeks into the season, Maclin appears to be a strong contender for the NFL’s Comeback Player of the Year award. The 26-year-old receiver missed the entire 2013 NFL season due to a torn ACL, but is back and better than ever in 2014. 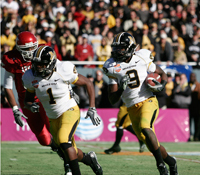 For full updates on Mizzou Made players in the NFL, visit MUTigers.com.